he alleged suicide by a 17-year-old student of Kokkuvil Hindu College in Jaffna must be a wakeup call for the government, the Tamil leaders and society at large. He was said to have committed suicide by jumping in front of a Colombo bound express train and his school bag had contained a note demanding the release of political prisoners, a hot topic in the Tamil media these days. There can be no doubt that this incident was a direct upshot of emotional Tamil media hype over the prisoners’ issue, which was never seen in the past, when the government totally ignored the matter. It was illogical for Rajeswaran Senthuran to take his life in a bid to draw attention towards the problem or purely in frustration at a time when the government had already taken a policy decision to expedite the actions pertaining to the prisoners under the notorious Prevention of Terrorism Act (PTA). Already some prisoners have been released on bail as suggested by the Chief Minister of the Northern Province C.V. Wigneswaran after the prisoners staged a fast. Also a programme to release the rest of the prisoners through a rehabilitation process has been agreed upon. 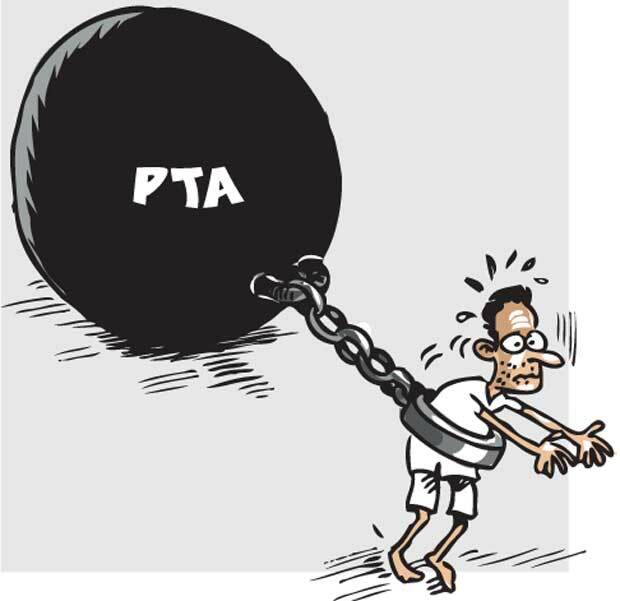 Except for a small group of disgruntled deposed politicians, nobody seems to be of the view that the Tamil prisoners under the PTA, whether they have involved in terrorist activities or not in the past, should be kept behind bars any longer, since many of them have already spent even 20 years in prisons even without charges. But politics has crept into the issue in the guise of patriotism on the one hand and sympathy as well as a cry for human rights on the other, creating an overzealous campaign which had ultimately resulted in this tragedy. The incident is an indication of a hidden threat to the government as well as the traditional Tamil leadership in particular and to the much-talked-about reconciliation in general. Although the sympathy Senthuran had over his compatriots in prisons was praiseworthy, the extremism in his action coupled with the actions of some extremist politicians in the north points to an impending danger, though remote. Taking one’s life for political or communal ends has been extremely rare in the south, but as far as the north and the east is concerned we cannot forget the much feared suicide bombers and the cyanide culture that had been introduced by the LTTE -the Liberation Tigers of Tamil Eelam. In 1980s these actions started as isolated and rare incidents starting from the incident where a youth called Urumpirai Sivakumaran took a cyanide capsule when he was surrounded by the Police on June 4, 1974. With the veneration and glorification of these rare incidents a trend emerged which turned into a culture with the passage of time. However, the suicide culture created by the LTTE almost lost its sentimental value with its excessive use and the LTTE finally used the tradition as a weapon against the people whom the outfit claimed to be fighting for, when they attempted to escape its captivity in Puthumattalan area into the Army-held areas. Extremism in politics, particularly in ethnic politics is highly dangerous, since it is very easy to justify it among the ethnic community concerned and the moderates in the community would find it very hard to withhold it, leave alone other communities countering it. For thirty years we experienced it in the north and the east and for about three years in the south which culminated in the Aluthgama riots. Middle East showcases another kind of extremism. Traditional Tamil leaders such as A. Amirthalingam, V. Yogeswaran, V. Dharmalingam, M. Alalasundaram, M. Sivasithambaram and the Middle Eastern leaders paid the price for feeding or allowing the extremism to grow with their own lives while former President Mahinda Rajapaksa paid it with his political power. This is not to suggest oppressive or suppressive measures as a remedy, but it would be prudent for the leaders of both the government and the Tamil community to have a sensible dialogue on the matter.